Here’s Part I and Part II of the series. One of the great failures in communication is to use the same words with a person, but have different understandings of what those words mean. This failure is even worse when these words are associated with or derived from the bible, and yet have taken a totally different meaning and are subsequently being read back into the bible. So for those who actually do care about what the bible and Jesus has to say to the world, a vital skill to develop is the discernment to recognize when biblical words have been co-opted by the culture around us, and to ensure that we articulate a clearer explanation of what we mean when we use those words. In this respect I believe that one of the saddest and most damaging failures of contextualization amongst Ghanaian bible teachers for decades is how the wonderful New Testament language of “grace” has been totally bastardized by Ghanaian culture, unhinging it from its biblical roots. As with everything that Christendom comes along with, it’s gotten so bad that this unbiblical usages has become the standard way by which one’s “devoutness as a Christian” is judged in Ghana. Let me explain. “The most important advance of New Testament scholarship in the second half of the twentieth century has been its dramatic reframing of the relationship between early Christianity and formative Judaism”. – Richard B. Hayes, The Moral Vision of the New Testament. First century Jews believed that God chose Israel by grace – because he loved their fathers (Deut 7:7-8) – and not because of any work they did. To them keeping the law was a means of showing that one was indeed under grace. Grace was god’s gift of making them his “kingdom of priests and a holy nation” (Ex 19:6), a gift they did nothing to deserve. Paul’s usage of the word grace falls exactly in this same line. By the life, death and resurrection of Jesus Christ, the doorway had now been open for the Gentiles to also become a part of God’s chosen people as expressed by prophets of old about Yahweh’s return. This time however, membership shall not be counted by descent from Abraham, but by “faith in Christ”. For the Paul then, “grace” is about how Gentiles (and other classes of excluded people) came on equal footing with Jews to become part of God’s chosen nation. 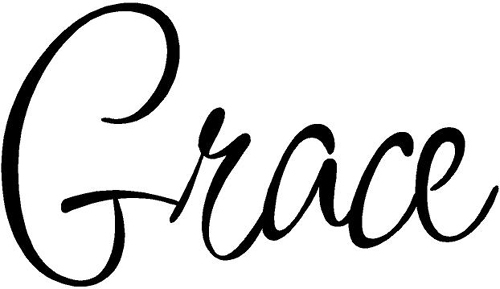 Paul further expanded the usage of the word grace to cover additional grounds. He speaks of God setting him apart “from his mother’s womb” to preach him amongst the gentiles “by his grace” (Gal 1:15-16). He speaks of receiving “grace and apostleship to call all the Gentiles to the obedience that comes from faith” (Rom 1:5). He calls the gifts of ministry given to his Gentile church members “gifts according to the grace given to each of us” (Rom 12:6). But Paul goes on to say something which is quite striking, and I believe has been the cause of stumbling of many in Ghanaian Christendom regarding the use of the word “grace”. He says everything he is and everything HE HAS DONE is God’s grace. It is explicit what Paul is talking about, but I think sadly many exegetes haven’t paid attention to the whole point Paul is driving at. In the above usages of “grace”, Paul speaks of it as empowering him to actually engage in mission for God – a mission which he has repeated mentioned – of bringing that same grace that he has received to the Gentiles. This second usage of “grace” describes then a special empowering to serve God, not just a grace to be anything he so desired. In essence, grace must lead to work, and Paul says his missionary efforts are all due to grace on his life. It would seem however that in the fervency of Christianity (especially the Protestant category) in Ghana to emphasize grace as God’s free gift, it has lost its anchor – 1) that grace was about God accepting us Gentiles (in this case Ghanaians) into his family aka election. 2) that grace was about the power to continue to serve in God’s mission (not our own mission) AFTER being called into this family. As I began to pay more attention to these usages of grace in the New Testament and to compare it to contemporary and historical Ghanaian Christianity’s usage of it, I began to realize how deviated we might be from the New Testament understanding of it. I recently asked in our church what people meant by the Twi word “adom”, and the answer was universally the same – unmerited favour for anything good in this life. And therein lies the problem – our concept of grace has no boundaries. We began to reflect on the songs we used to sing in our previous lives as Pentecostals and other Christian traditions (and some of which are still in vogue today), and the usage of the word “adom” in those songs – “adom” being the Twi word for grace. Note – This sounds a lot like “For in him we live and move and have our being” in Acts 17:28, but note Paul didn’t use the word “grace” here. I could go on giving more examples of Ghanaian Christian songs with this motif. The word “adom” in these songs has moved beyond grace as a means of election and as a means of empowerment to serve after joining the elect, to grace being used to describe any “good” thing that comes one’s way. This has led to the following behaviour and subsequent questions in Ghanain Christendom. Amakye Dede, a popular highlife musician whose music I love was involved in an accident last December, and his manager died. He survived, and in typical Christendom fashion, Christians responded with “It’s only God’s grace that saved him from the accident”. The question becomes why did that grace – if it’s free and unmerited – not extend to his manager? Or did Amakye merit it? A marriage announcement is typically made with “By the grace of God, Kofi is getting married to Ama next week”. If grace is free and unmerited, why is Adwoa who is 35 years old not married, but Kofi and Ama in their twenties are getting married? During prayer meetings, one is reminded to pray thanking God that one is alive, because it is only by the grace of God that one is alive and not at the ICU of Korle-Bu Teaching Hospital, Ghana’s largest hospital. The obvious question is – if grace is free and unmerited, what kind of arbitrary God would decide to put some in a coma and allow some to breathe air freely? And is it the abundance of my thanks that keeps me from being in a coma like those unfortunate brethren? If that’s the case, is that grace really free and unmerited? But what Christendom doesn’t realize about being precise about language is that if we decouple it from it’s biblical moorings, our words will be (and have already been) co-opted by interests not aligned with Jesus Christ, and we will either complain bitterly about these to no end or end up reading the bad usage back into our bibles. Let me give an example. Can Christians endorse this usage of the word grace, especially when being used to talk about the God of Abraham, Isaac and Jacob? Is this the way of the Christian God as we see in the bible? And yet EL is very right if judged by the already flawed understanding of “grace” in Ghanaian Christendom. If anything one determines as “good” for oneself must have been made available to you “by the grace of God”, then EL’s ability to snag any woman he desires is indeed by the grace of God. By extension, the ability to steal money from one’s public service job to build a nice house for oneself is “by the grace of God”, not so? Ever wonder why corruption is not going anywhere soon when the 70% Ghanaian Christian population think like this? And one of the clearest ways that we can begin tackling this is to properly introspect our “gospel” songs, even our old favourites. Because the easiest way to spread false teaching in Africa is to put it to a nice danceable beat. The African love of dancing is a double edged sword that has been used to carry flawed theology for eons, and cannot be left to wander on its own without inspection. It’s part of the reasons why in my church we resolved to write and sing our own songs, instead of complaining about some of the trash being produced in the name of “gospel” music in Ghana. I’ve had pushback from some friends about my qualms on the abuse of this “by the grace of God” theme, even when answering the simple question “how are you”, but I’m not budging from it. I might consider it if I were a high Calvinist and believed in divine determinism, but I’m not and so I desire that we rather wake up from this abuse. Because if we do not become a people who properly discern our culture, there will be only one end result – our culture will swallow us up, and there will be nothing left of true Christianity to speak of, practice or even defend.